Enjoyable, brightly animated tale with likeable characters, several good gags and an impressive vocal cast – this is easily the best of the animated Asterix adventures to date. 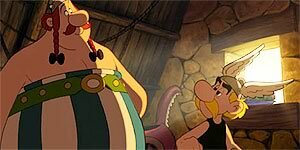 When Chief Vitalstatistix's lazy nephew Justforkix (voiced by Sean Astin) arrives in the little Gaulish village, the Chief asks Asterix (Paul Giamatti) and Obelix (Brad Garrett) to help toughen him up a bit. However, when Justforkix is kidnapped by a Viking horde (who mistakenly believe him to be a Champion of Fear and thus in possession of the secret of flight), Asterix and Obelix set off in hot pursuit. Adapted from Asterix and the Normans, the plot has been somewhat expanded from the book, to include a couple of sub-plots: one in which Viking Chief Timandahaf's feisty daughter Abba (Evan Rachel Wood) attempts to bring women's rights to the horde and another in which soothsayer Cryptograf (Greg Proops) schemes to inherit the Chief's position by marrying off Abba to his dim-witted son, Olaf. The traditional, hand-drawn animation is excellent, retaining the feel of Goscinny and Uderzo's original comic-book, even if a few unavoidable liberties have been taken to update it for a modern audience - a pigeon called SMS, a smattering of rock music, the addition of Abba's character, etc. Paul Giamatti is perfectly cast as Asterix (you can imagine him playing the role in real life) and there's strong support from both Sean Astin and Evan Rachel Wood, who invest their characters with plenty of life and energy. There's also tonnes of action and the film delivers as much Roman-bashing, boar-chasing and pirate-sinking as you could possibly hope for from an Asterix film. Thankfully, the American dub is actually pretty good, which is more than can be said for the utterly abysmal American dub of the live-action Asterix and Cleopatra, which ruined an otherwise excellent film. A lively, brightly coloured adventure that should please Asterix fans of all ages. Recommended.